Girl Scout Registration is now OPEN! Have a laptop at troop meetings so parents can renew on the spot. Hold an end-of-year parent meeting to do this. Renewal Party as a part of end-of-year activity party. Budget for membership fee and any financial assistance from cookie proceeds. Give parents an incentive (token of appreciation) for renewing membership. Have girls help parents with online renewal. Family Partnership donations make a difference! 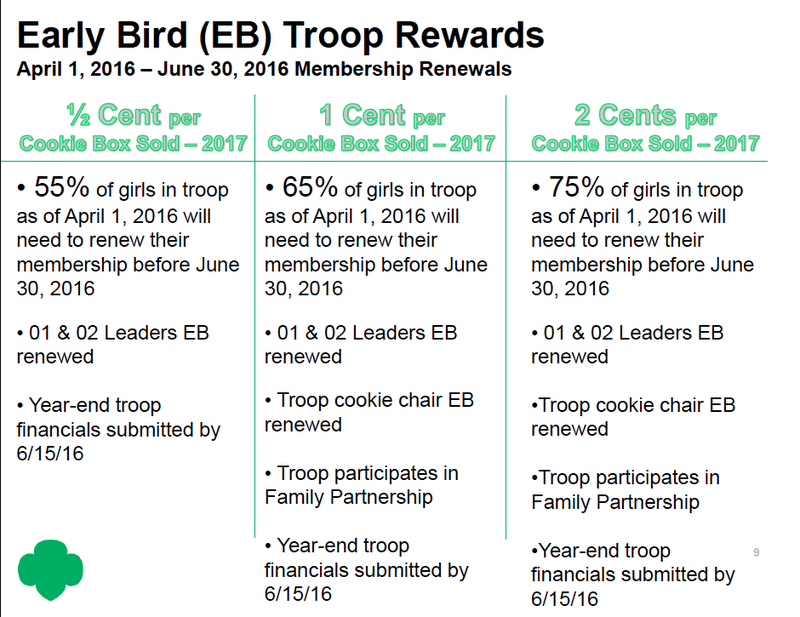 Please encourage your troop parents to make their donation at the same time they are registering. And lastly, please don't forget to complete your Annual Troop Finance Report - due JUNE 30, 2017. Troop registration is not complete until the financial report (along with a copy of the bank statement) is on file. Please forward the original to Dawn Miller at 1717 Outpost Lane, Pasadena, CA 91107. Please keep a copy for your records. Registration questions or need help? Please contact Dawn Miller at outpostlady@earthlink.net or 626-797-1880.